Military Domestic Violence Defense Attorney | Anaya McKedy P.C. The potential end of their career. At Anaya-McKedy, P.C. we understand the consequences that military members can face when they are arrested for or charged with domestic violence. We also know how crucial it can be to have an experienced lawyer on your side, working relentlessly to defend and protect your rights. That is why we are committed to vigorously defending military members in misdemeanor and felony domestic violence cases. Our attorneys have more than 30 years of criminal trial experience, including experience as former prosecutors. This gives us the insights and skills to effectively anticipate the prosecutor’s arguments and strategically craft and present your defense. It also empowers us to successfully guide our clients through the criminal justice system while helping them achieve the best resolutions possible. We represent members of all military branches in criminal cases and court martial cases. We deeply appreciate your service to protect us and our rights. Now it’s time to let us help you protect and defend your rights and future. Are You or a Loved One a Member of the Military Who Has Been Accused of Domestic Violence? We are available 24/7 to answer your questions, put you at ease and defend you. We can discuss your case over the phone or at an in-person meeting at jail or our Colorado Springs office. What Are the Civilian Penalties for Domestic Violence? How Involved Is the Military in Investigating Domestic Violence Cases? The accused is an active member who was on duty when the alleged incident occurred. The alleged incident took place on base or at a military installation. Bar the accused from entering base and other military installations. 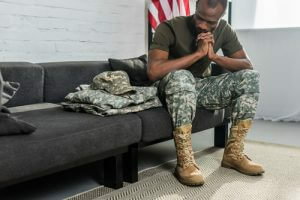 What Are the Military Penalties for Domestic Violence? The inability to obtain certain professional licenses or certifications, like those required to practice law or serve as a law enforcement officer. Put 30+ Years of Criminal Law Experience in Your Corner: Contact an Experienced Colorado Springs Domestic Violence Attorney at Anaya-McKedy, P.C. If you or a loved one is a member of the military who has been accused of, arrested for or charged with domestic violence, call (719) 227-0007 or email us to speak to a trusted Colorado Springs domestic violence attorney at Anaya-McKedy, P.C. Put your freedom, reputation, career and future in the experienced hands of our lawyers. We will fight for you and work tirelessly to defend you, minimize the negative impacts and achieve the best outcome possible. Regardless of the level of charges you face, we understand that your case is likely the most important thing in your life, and we will handle it with the highest level of expertise, care, professionalism and diligence. Our extensive experience and record of success in domestic violence cases have earned us numerous professional honors, 5-star reviews on Facebook and Google, and the respect of colleagues, local judges and prosecutors.